In our opinion, this is the most important element that differs from SVG. With canvas you can perform operations on pixel based artworks. You can write a new image pixel by pixel or import an image in the canvas and modify it as you need. In this article we’ll show you some fundamentals of pixel manipulation in the canvas, and how to use this knowledge to obtain interesting effects. Let’s start from the beginning. Now our image is in position, but we need to know more on how to manage pixels. As perfectly described by Opera, pixels in a canvas are represented from left to right, from top to bottom. Every pixel has 4 values: red, green, blue and alpha. It’s easy to understand the power of this principle: you can work on every single pixel and change the values. It’s like editing an image by hand, instead of using a desktop application. So, looping trough the pixels array, we’re going to get an interesting black and white effect. There’s our black and white effect. Let’s start from the beginning of our code because it’s a little bit complex. Using the function getImageData() we store in a variable imgd our image and we’ll be able to access every single pixel by storing the data array in the pix variable. Then we use a for statement to loop through each pixel, and through each value of a single pixel. As described before, every pixel has four values: red, green, blue and alpha. So, pix[i] is red, pix[i+1] is green, pix[i+2] is blue and pix[i+3] is the alpha channel. So, what can we use to make an image black and white? The luminance. The luminance is how much a color is luminous to the human eye and it’s used to measure the clipping white in video editing systems, for example. In video editing system a white color that “break” the screen is a white that is too white to be represented on a common TV. This is important because by calculating the average number between red, green and blue values we could obtain a value for every pixel that represent a static mathematical representation of the color luminance. But there’s a problem, an human eye see colors dynamically. For example, if we take similar shades of blue and green, our eyes will detect the green color more luminous than the blue. In our algorithm we could use the static average formula, but our image will be too flat, and we’ll lose a lot of color depth. So, let’s introduce the luminance formula: red x 0.3 + green x 0.59 + blue x 0.11. Marco Lisci (Web Design/Dev) and Luisa Scarlata (Creative/Copywriter) design and develop for the web, have creative ideas and write award-winning copy. Visit their website at Bad Shark Communications. Pretty sweet tip, nice one! Very cool Marco! I’d love to see some live samples/demos to play around with color manipulation. I’m not sure about browser support so far, but the canvas element seems very powerful! I’ve used grayscale.js (which uses this technique) on the everton fc intranet to flip between grayscale versions of team crests on click. Beautiful work & great info. 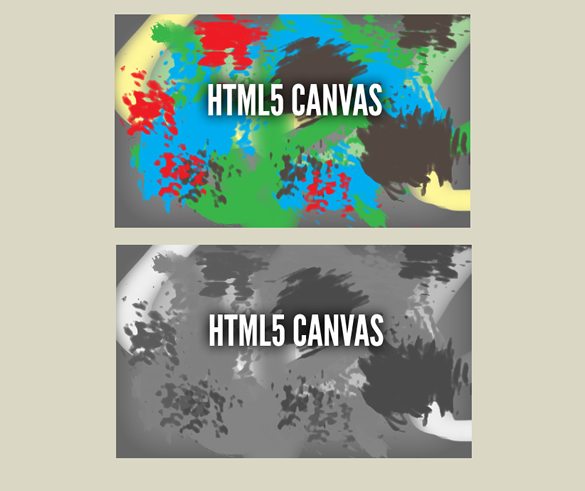 Getting into HTML 5, this is pretty interesting. Your posts are very easy to follow. Good job! Sounds great but i couldnt manage to get it working. Tested with Chrome. Has anyone succeded ? This reminds me when we used to play with pixels in the ’90s (Amiga and PC). I worked on a formula to convert HSV to RGB using the same basics. At least we are now using faster hardware. Awesome tips. Just love to see how much you can do with HTML5! Hi, I would like to know if one can import an image from the desktop to the canvas instead of importing it from a server? I have a website http://www.drawmics.com for which I want to implement this functionality using canvas or svg. 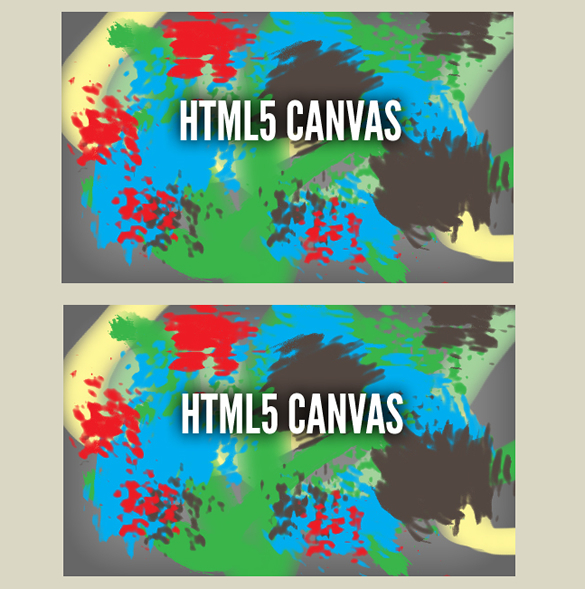 Hi I am working on HTML5 canvas tag, I used the getImageData in my example in firefox to change the color of image to grayscale…. but it shows error ….. can any body tell me how to over come this?? Has anyone tried to change the image width and height without affecting the clarity of the image.. Please help !